Cross-country wise, we’ve been trying to make the most of the taskable days presented to us. 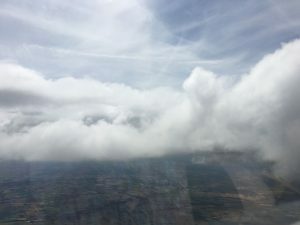 Today was another day that looked sufficiently taskable to result in a turnout of cross-country pilots. The expectation was that the milky top-cover would be thin enough to allow an early thermal start followed by an early shut-off as the top cover thickened. The topmeteo and RASP forecasts were broadly in agreement and they turned out to be right. General tasking was South-East as far as Aylesbury or Thame and then North East to Alcester with a leg back to Edgehill. Several 18M ships took this tasking along with a Duo Discus. The club’s 15M LS4 tasked shorter along the same line with an out-and-return from Bicester. The 18M ships made their Southern turnpoints but on returning to the Stratford area were met by an overcast sky with scarce thermals. The club’s LS4 turned Bicester and made it back around the same time. Meanwhile Duo Discus 666 managed to get around the whole task by taking some pretty long glides through thermal-less areas to reach better climbs. 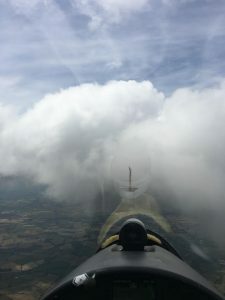 This entry was posted in Flying reports and tagged cross country, flying, soaring by admin. Bookmark the permalink.